Another Antiques Roadshow find? 1868. Painting of Lava.—On the morning of this past Wednesday, placed outside the Bookstore of Whitney was a painting of a river of lava flowing and entering the sea of Kahioipakini [ka Hioipakini] in Kau, done by H. M. Whitney and sent here to Honolulu. A copy of that was painted by Joseph Nawahi [Iosepa Nawahi], (Kahooluhi), and it is placed at the entrance of our business office to show to the public. There have been many hundreds of men, women, and children who have come in droves to see it starting on that day. The people were filled with fright and fear at this frightful representation of the deeds of Almighty God. Seen are four volcanic cones ablaze upland of the house of Captain Brown in Kahuku. 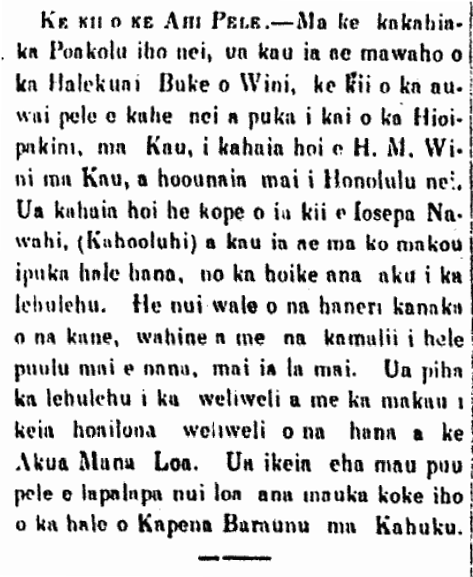 Ka Nupepa Kuokoa, Buke VII, Helu 16, Aoao 3. Aperila 18, 1868. This entry was posted in Advertisement / Announcement, Arts and Crafts, Volcanic Eruption and tagged Antiques Roadshow, Henry Martin Whitney, Hooluhi, Iosepa Nawahi, Joseph Nawahi, ka Hioipakini, Kahioipakini, Robert Brown, Wini by nupepa. Bookmark the permalink.